Rose is one of the most popular and loved of the beautiful flowers of all time and its beautiful meaning is known by almost all at some level. Roses, with their unique combination of thorny stems and fragrant blossoms, are often prized as a symbol of achievement, completion and perfection. Rose is a perennial plant that has over 100 species. Some of them have closely packed petals while some have loose leaves. A traditional rose is usually dark red in color with a long stem with thorns. Different roses symbolize different things; yellow rose symbolizes friendship, mature love and joy while white roses signify sanctity, purity, peace and secret admirer. 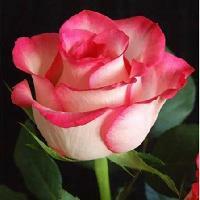 Red rose symbolizes immortal love and passion and pink rose stands for healing, innocence and first love. Their perennial bulb like form makes them a symbol of resurrection and determination. This beautiful flower is in the genus tulip and has 109 species. The flower has 6 petals and is distinctly separated from each other. 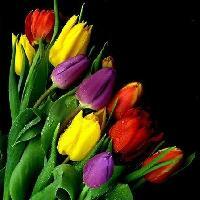 Tulips are available in various colors which include red, pink, yellow, orange and purple. Tulip flower is an 11thwedding anniversary flower and represents elegance and grace. Yellow tulips symbolize cheerfulness and white tulips stand for forgiveness. Purple tulip is synonymous with royalty and red tulips symbolize deep love.It is believed that the black velvety center of the tulip represents a lovers heart. When speaking of the most beautiful flowers, how can we leave out the orchids. Orchids are beautiful and delicate flowers with around 880 genera and 250,000 different species. Appearance wise, they look almost like an antiflower with their geometrical shaped petals, which makes them even more desirable and exotic. These highly coveted ornamental plants represent love, luxury, beauty and strength and are the 14thwedding anniversary flower. Pink orchids convey pure affection while cattily orchids signify mature charm. 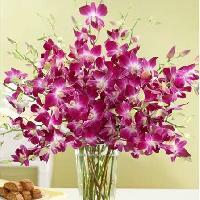 Pink and white orchid flowers can also be sent as a gesture of sympathy. Sunflowers were first grown in Central and South America and are a unique combination of beauty and utility. They are used for decoration purpose and for providing oil and food. 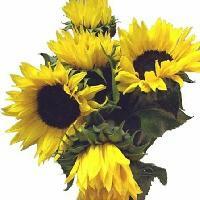 The cheerful faces of sunflowers symbolize the sun, warmth, happiness, adoration and longevity. They are the 3rd anniversary flower and is definitely the most loved among all the beautiful flowers in the world. 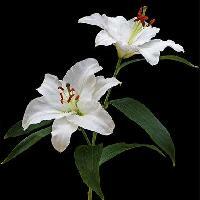 Lilies are the most commonly used flower for funerals because they symbolize innocence that has been restored to the soul of the departed. Stargazer lily symbolizes sympathy and is associated with majesty and purity and it was the symbol of Mother Marys purity and chastity. While the leaves symbolize her modesty, the white petal represents her innocence and purity. Peruvian lilies represent friendship and devotion while pink lilies represent wealth and prosperity. These beautiful flowers always bring peace to the receivers mind. 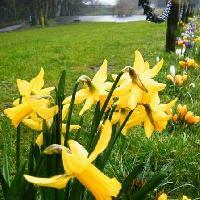 Daffodils are long stemmed beautiful golden yellow flowers which are synonymous with spring. The botanical name of daffodil is Narcissus and is also known as jonquils in England. Daffodils are a symbol of renewal and fresh start. They bring encouragement and hope to a grieving and unhappy person. Daffodils have several meanings attached to it. It stands for honesty, forgiveness and forthrightness. Chinese often see it as a symbol of fortune and celebrate whenever the daffodils bloom. A daffodil bouquet gifted to a person ensures happiness but do not give a single flower as it can foretell a misfortune. Marigold is one of the most popular and common flowers.The flowers bloom to different colors like gold, orange, white and of course yellow. Marigold flowers with maroon outlines make them appear even more beautiful. 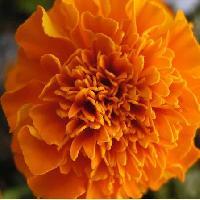 Marigold flowers are associated with sunlight which is supposed to carry positive meaning. However, it has also been perceived to be associated with darker qualities. It can symbolize jealousy, cruelty, sorrow and grief. Some culture also associates this flower with death. The lotus plant belongs to the Nillumbik genus and carries symbolic significance in major cultures across the world. 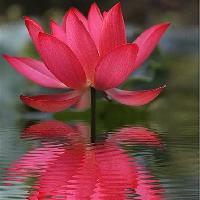 Lotus plants floral meaning is rebirth and divinity. In Buddhism it is viewed as a sign of purity of speech and mind and is associated with spiritual awakening and enlightenment. In Hinduism it is associated with beauty and represents how a person can be awakened to the spiritual reality. In Egypt lotus stand for the sun. The most striking feature about lotus is that although it grows in mud and returns within, it flowers clean the next day. Dahlia flower is a national flower of Mexico and is named after 18thcentury botanist Anders Dahl. It belongs to an asteraceae genus with over 30 species in its family. Dahlia has a vast range of hues from bronze to red and white to purple and is grown throughout the year.Dahlia carries a series of meanings with itself. It can either be a sign of warning, to change or a symbol of betrayal while in Victorian language, dahlia stands for the flower has survived. It expresses sentiments of dignity and elegance. It is a symbol of commitment and a strong bond that will last forever. 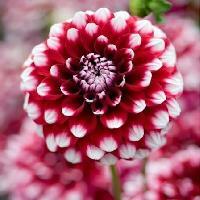 Thus dahlia is often used for flower decorations to celebrate love and marriage. 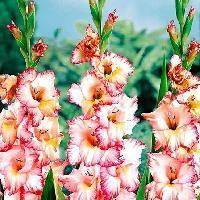 Gladioli are tall flowers and are composed of multiple flowers. They stand up to 4 feet tall. It is mainly grown in South Africa, Europe and Mediterranean regions of Europe. This flower is available in a variety of colors like white, pink, purple, yellow, orange, green and salmon.